1820, 1821, 1822, 1823, 1824, 1825, 1826, 1827, 1828, 1829. The webmaster tries, in these pages, to record, as accurately as he can, the available data re each vessel. In this case that is most difficult to do. Let me first state that the vessel is, I believe, Lloyd's Register ('LR') listed from 1820 thru 1852/53. For all of that period, with the exception of 1852/53, the vessel was owned by Balantine or Ballantine, or Ballantyne or a name close to that, likely of Anstruther, Fife, Scotland. The owner's name is, as you may surmise from my words, LR spelled in many different ways. The owner would seem also to have been the vessel's captain thru 1825. LR also spelled the vessel's name in a number of different ways. As Helens & Helen's, as well as Helen. Perhaps the greatest puzzle re the vessel is that the vessel is recorded twice in LR of 1836/37, firstly as Helen, built in 1820 of 124 tons & secondly, in the supplement, as Helens, completed or registered in Mar. 1837, of 176/191 tons. LR reverted to 'Helen' in & from 1838/39 but the new tonnage & the 1837 year of build stayed for the balance of the vessel's LR lifetime. How can all that be so? I do not recall another vessel that when repaired did not retain its original build date. Could it be that the vessel suffered damage & was de-registered. And was re-registered when both repaired & enlarged. Merely my guesses until good data emerges! Unusual also is the LR record re her captains. In 1826, but briefly, J. Miller became her captain. From that point onwards, all the way thru to 1851/52 per LR, some 26 years, T. Taylor is stated to have been her sole captain. What were the official build numbers for 1820? Do please advise me if you know. A vessel which had a very long life. But some puzzles in the data. The vessel is Lloyd's Register ('LR') listed from 1822 (stated to be one year old) thru 1833 (stated to be 12 years old) & then thru 1838/39 &, so far as I can see, not thereafter. The vessel's initial owner was 'Clark' for service from London to Malta in 1822 & 1823 & from London to Naples, Italy, in 1824. It would seem that Clark was likely T. Clark, who was the vessel's captain, per LR, in 1823 & 1824 - just 'Clark' in 1822. In 1825, Duke & Co. became the vessel's owner, thru 1831, with T. Clark continuing to serve as her captain thru part way thru 1827 & W. Waters thereafter. For service from Liverpool to Trieste, Italy, thru 1827, ex Cowes, Isle of Wight, in 1828 & 1829, & from London to Buenos Aires, Argentina, in 1830 & 1831. In 1832, Scott & Co. became the vessel's owner for service ex Cork, Ireland, with J. Williams or Williams serving as her captain thru 1833 at least. 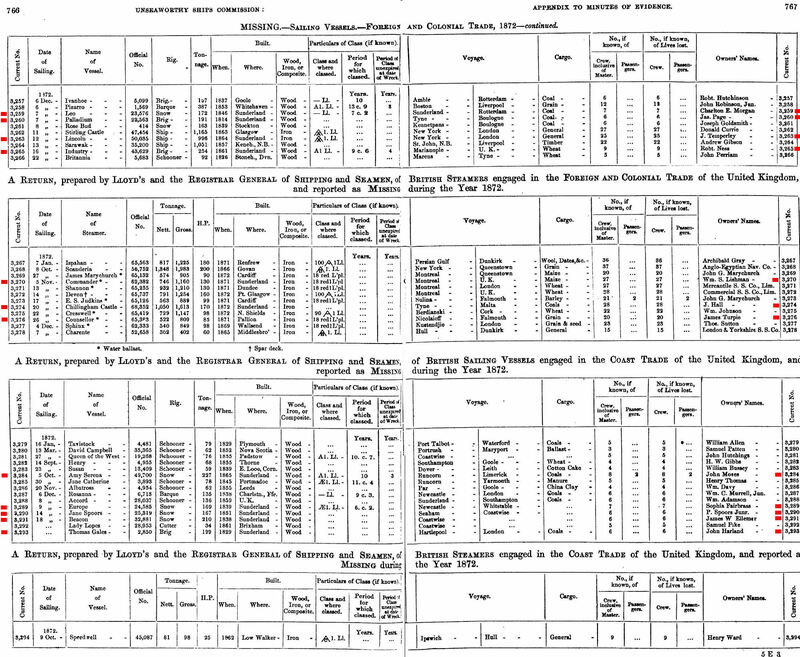 The LR data in years 1834 thru 1838/39 is cryptic indeed. But is better than the long LR silence thereafter. On Feb. 21, 1861, per line 1696 here, the 118 ton brigantine, en route from Newport, Wales to Cork with a cargo of coal, was lost at Dungarvon (located on the SE coast of Ireland 1/2 way between Cork & Waterford). Crew of 6 - 4 lost. Then stated to be owned by George Scott. The loss of the vessel is referred to on this page (search for Susan) as being at Ballinacourty which is I learn near Dungarvon. Can anybody tell us about the circumstances of her loss? What were the official numbers for 1821? Do please advise me if you know. Was owned by W. Potts. Some malicious damage in Mar. 1830, when owned by Mr. Hodgson. 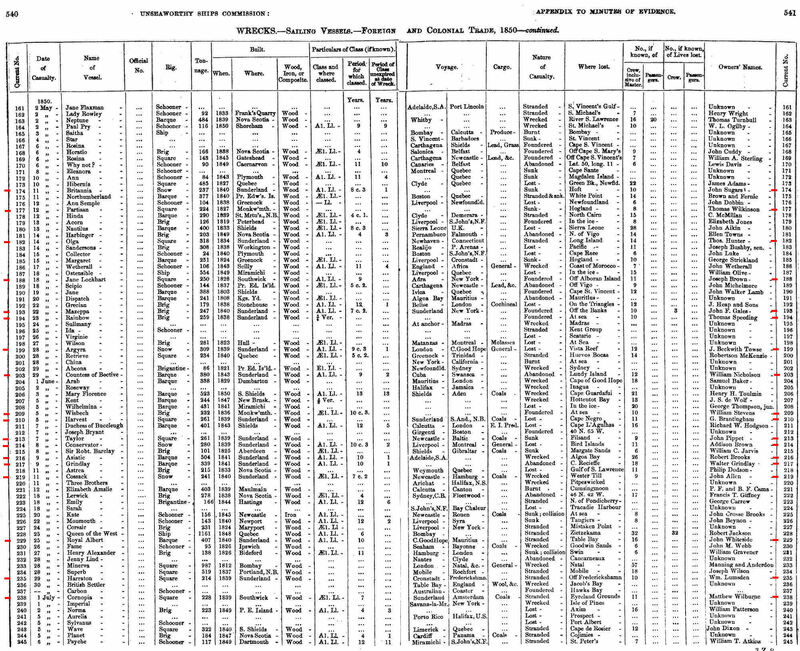 Christies Maritime Register of 1858 states that James Storm of South Shields was the vessel's then owner. What were the official numbers for 1822? Do please advise me if you know. E. B. Ord & Co., later owned by Wilson & Co. The vessel is Lloyd's Register ('LR') listed from 1824 thru 1861/62, & not thereafter. It was initially owned, per LR, by Lees & Co. for service ex London. In 1827, the vessel, now a brig, became owned per LR by Dobson & Co. for service from Liverpool to Le Havre, France. 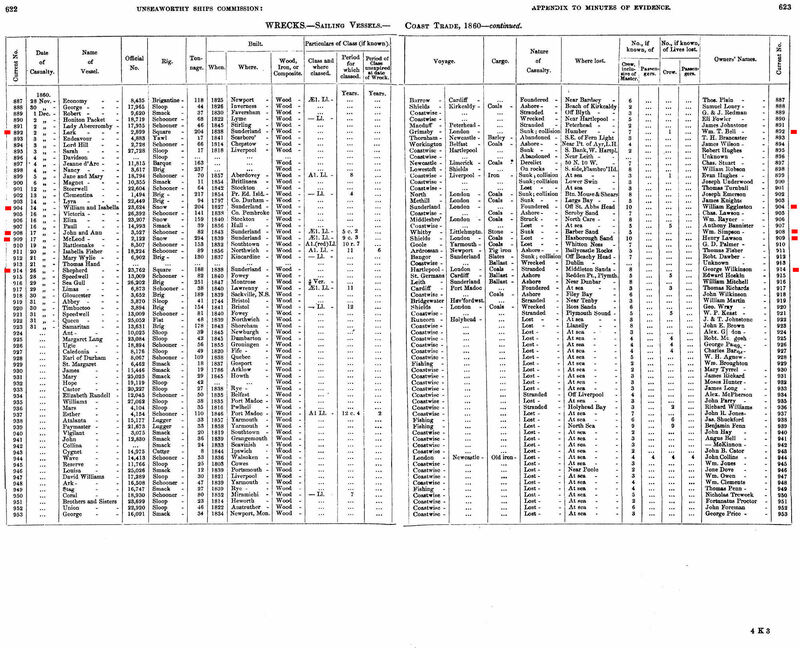 In 1834, a snow again, Walker & Co. of Sunderland became the vessel's owner for service from Sunderland to London - thru 1841/42 in which year T. Brown of Sunderland became the vessel's owner for service from Sunderland to the Mediterranean (to 1842/43) from Sunderland to Cronstadt, St. Petersburg, Russia (thru 1845/46), from Sunderland to London again (1846/48) & Sunderland to the Baltic (1848 thru 1851). 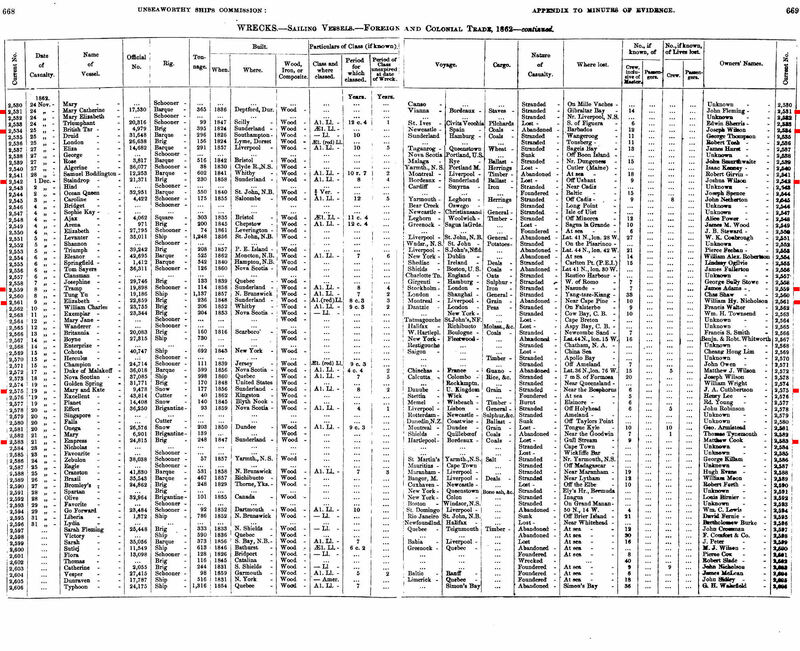 The LR data after 1850/51 is most limited though T. Brown is still listed as the owner thru 1861/62. 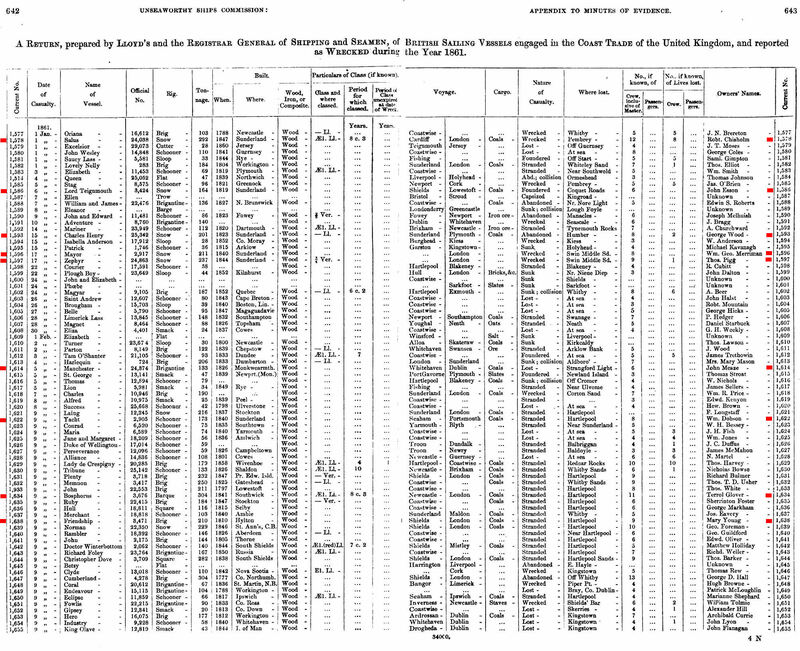 The North of England Maritime Directory of 1848 lists T. & R. Brown & R. McGregor, both of Bishopwearmouth, as the then owners of the 233 ton brig. 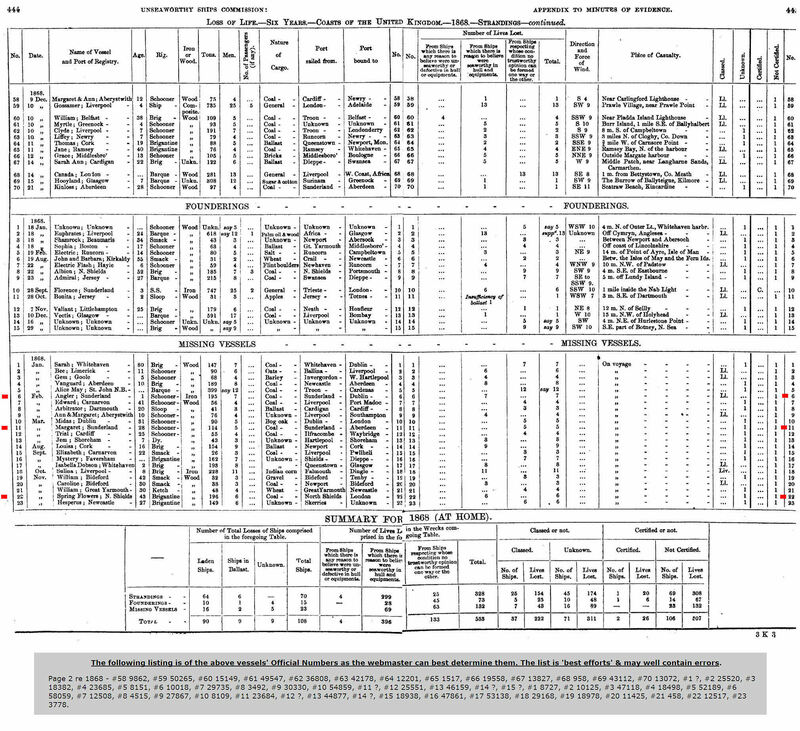 Note that LR lists R. McGregor as the vessel's long-term captain - serving in that capacity from 1839/49 thru to 1854/55. 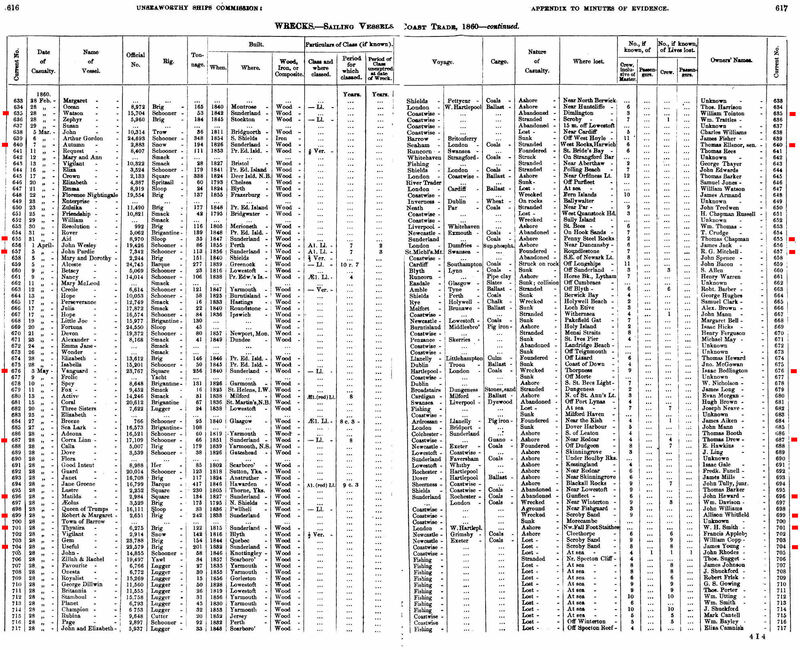 Turnbull's Register of 1856 lists R. Brown & R. McGregor, both of Sunderland as the then owners of the vessel, then a 201 ton snow, while Christie's Shipping Register of 1858 lists only Robert McGregor as her then owner. On Jan. 15, 1861, per line 1593 here, the 201 ton snow was abandoned at the Humber river while en route from Sunderland to Plymouth with a cargo of coal. Crew of 8 - 2 lost. Then stated to be owned by George Wood. The detail circumstances of the vessel's loss are not yet to hand. Can you tell us more? I have not researched the vessel thru Lloyd's Register. 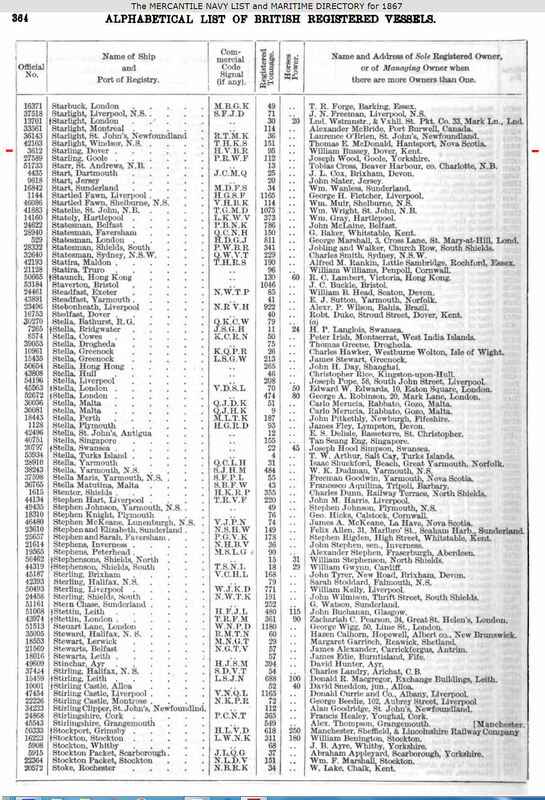 Turnbull's Register of 1856 lists the vessel as then owned by J. (John) Hutchinson of Sunderland. As does Christie's Shipping Register of 1858. Christie's also advises, at page bottom, that the vessel had been lost. 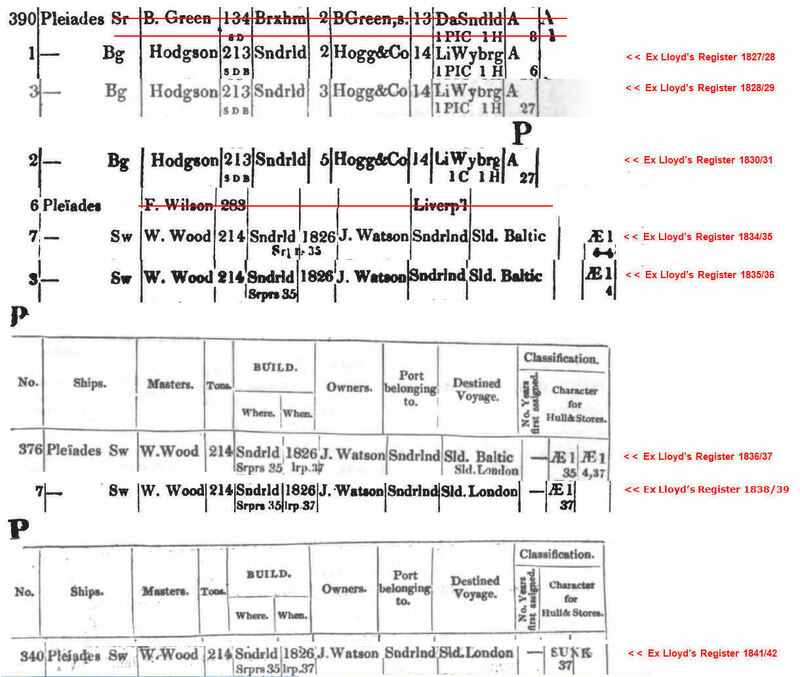 The vessel is Lloyd's Register ('LR') listed from 1823 thru 1855/56 with the exceptions of 1843/44, 1844/45 & 1847/48. The 184 ton brig was initially & for a great many years owned by W. Rutter. I cannot tell where the vessel was initially registered but later Rutter was of Hull (certainly from 1834) & London (from 1835/36). Per LR, 'Rutter' owned the vessel thru 1840/41 for a variety of service. Ex London to i) Trieste, Italy, in 1823, ii) Rio de Janeiro in 1824, iii) Ceylon (now Sri Lanka) in 1825, iv) Cape of Good Hope ('CGH') in 1826 & 1827, v) the Baltic in 1828, vi) St. Helena from 1829 thru 1831. Service from Hull to 'Str'ts' is indicated in 1832. The vessel served CGH again, from London, during the period of 1836 thru 1941. 'Rutter' captained his own vessel for many of those years - from 1823 thru 1836/37 except for a year or so when J. Roberts was her captain. J. or J H. Palmer served as the vessel's captain from 1836/37 thru 1840/41. The vessel first became LR listed at 217 tons in 1831 & from 1835/36 thru 1842/43 was listed as a barque rather than as a brig. In 1840/41, per LR, Boase & Co. of Penzance, Cornwall, became the vessel's owner , thru 1842/43, for service from Penzance to Merimac (where is it? Maybe Merimac river, Massachusetts, U.S.A. or more likely Miramichi, New Bruswick, Canada - read on). With C. Collense serving as the vessel's captain. LR of 1842/43 notes that the vessel had been 'Abandoned'. 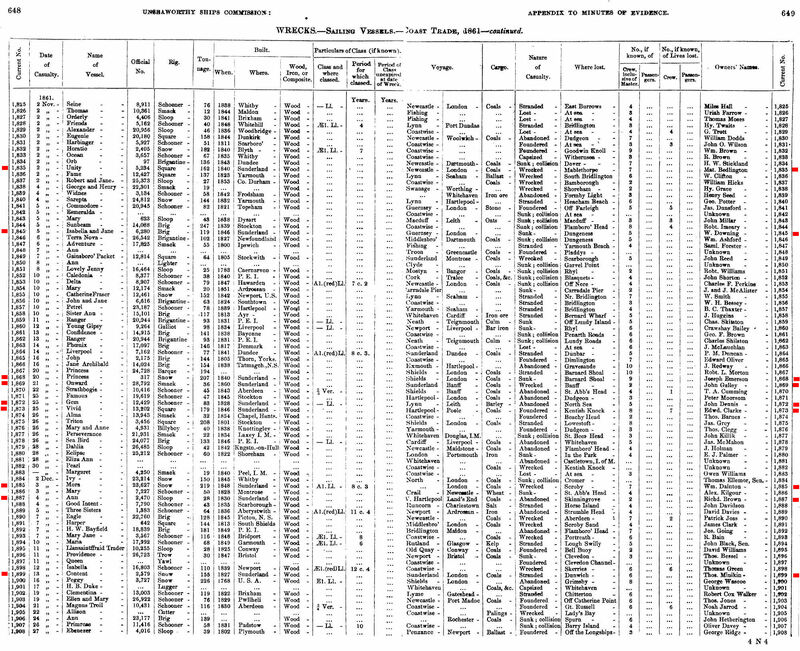 A list of 1842 shipwrecks at Wikipedia, records Pero as abandoned in Dec. 1842 while en route from Miramichi to Penzance. The crew was rescued by a vessel named William and Mary. It was not LR listed in 1843/44 & in 1844/45 & the webmaster thought that must surely be the end of the vessel's history. It would seem not! The vessel was again LR listed in 1845/46, now a snow of 225/247 tons, owned by Scott & Co. of Cork, Ireland, (Scott & Son from 1849/50). Was it recovered & rebuilt? For service from Cork to Quebec, Canada, in 1845/46 & 1846/47. 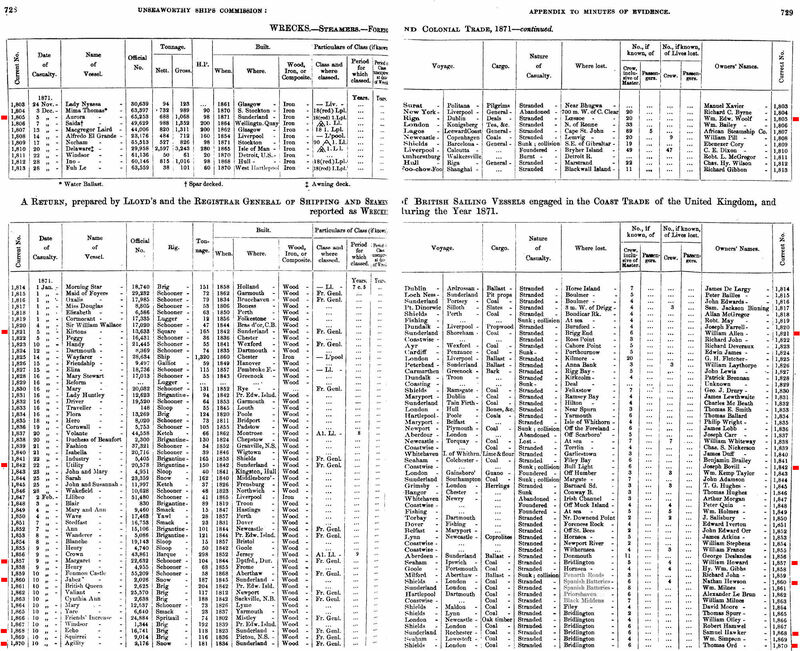 In 1848/49 service from Newcastle to U.S.A. became service from Cork to Boston, Massachusetts (thru 1852/53). Service from Cork to Quebec is noted in LR of 1853/54. 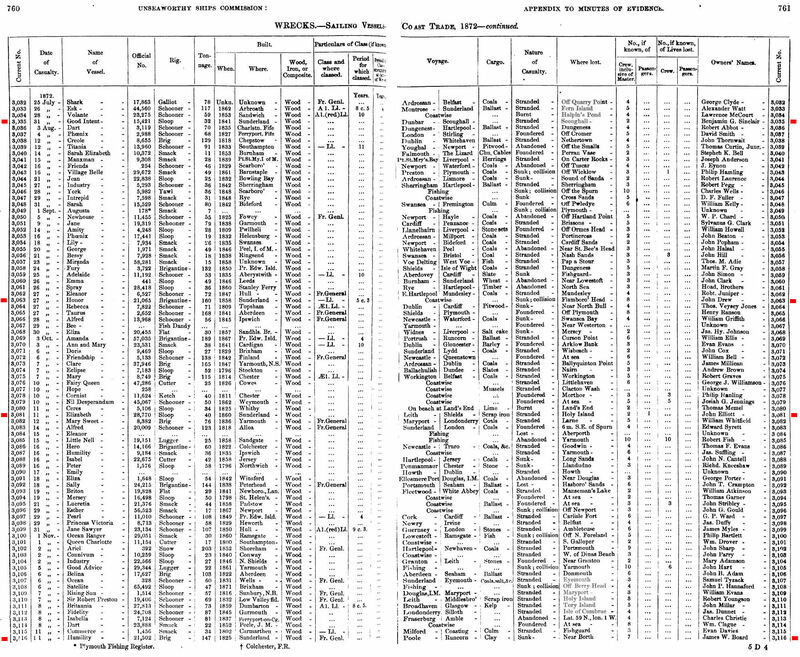 LRs of 1854/55 & 1855/56 list Scott & Son as the owners but provide minimal other detail. Per LR, the vessel was captained by 'Meredith' in 1845/46 & 1846/47 & by 'H. Wheler' (Wheeler?) 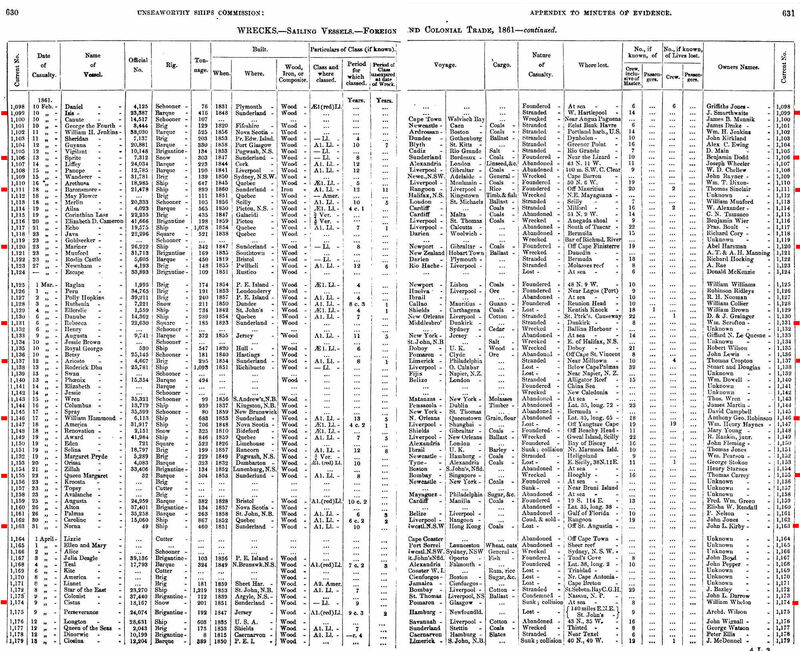 from 1848/49 thru 1855/56. Now this vessel was first site listed as a result of reading that a vessel of the name, built in 1823, had been sold for �2,300 at an auction held in Liverpool on Dec. 7, 1854. A part of the estate of Edward Oliver of Liverpool (who died in Oct. 1854). See here for the data source. The webmaster believes that such Pero is this vessel. The vessel is recorded in Lloyd's Registers ('LR') from 1824 thru 1832, is cryptically listed from 1834 thru 1837/38. & from 1838/39 thru 1844/45 & not thereafter. The vessel was initially owned by Storey & Co., surely of Sunderland, for service ex London. From 1825 thru 1832 at least, J. Ridley & Co. owned the vessel for service as a Plymouth coaster - J. Ridley was listed as the vessel's captain for that period & in fact, in 1824 also. 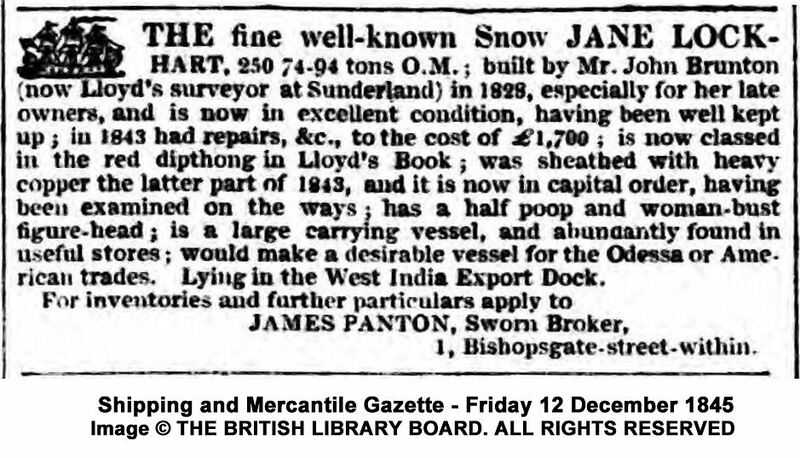 From 1838/39 thru 1841/42, J. Ritson of Sunderland owned the vessel, now a snow, for service from Sunderland to London. In 1841/42, Hudson of Sunderland, became the vessel's owner for service as a London collier. 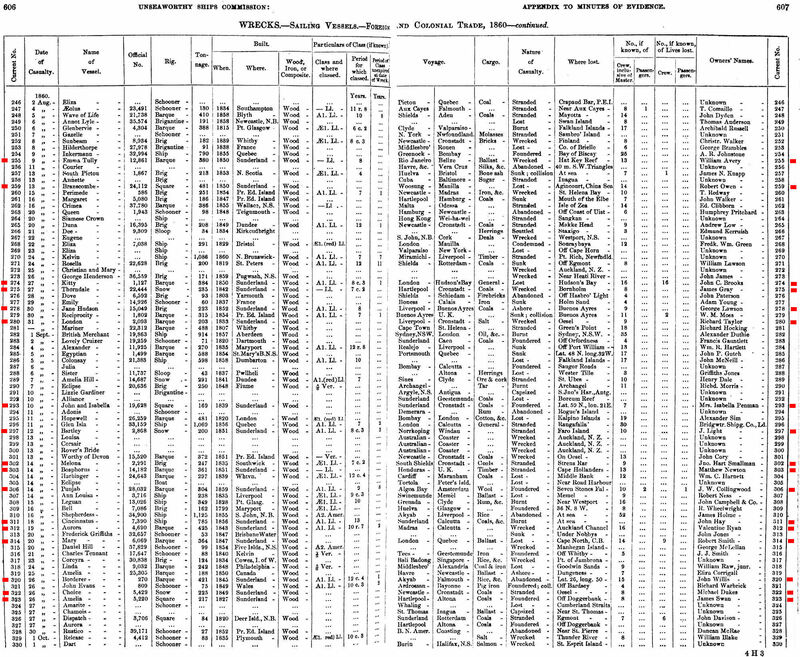 The North of England Maritime Directory of 1848/49 lists the vessel's then owners as being G. W. & R. M. Hudson of Sunderland. It would appear that the vessel was later registered at Shields. 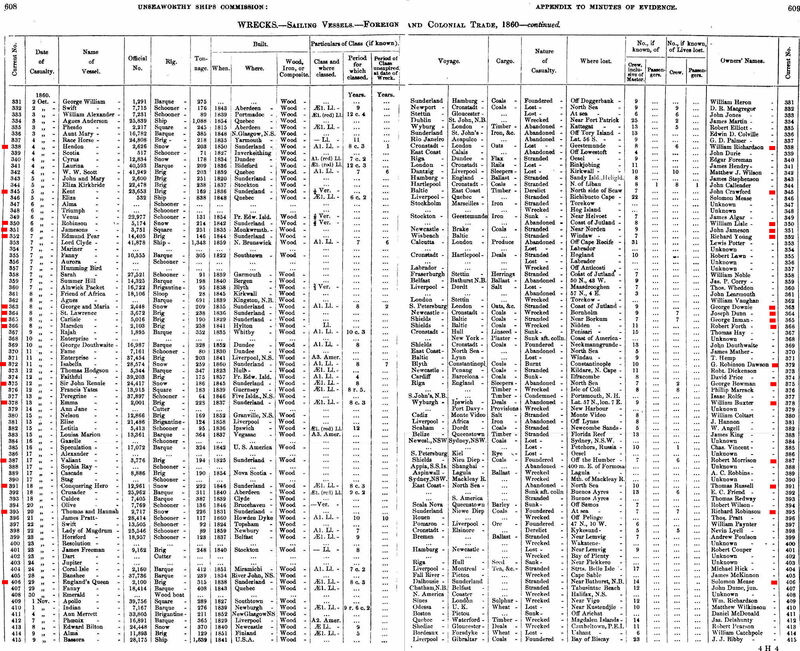 However in 1858, per Christie's Shipping Register, the vessel was registered at Stockton & owned by William and Matthew Scrafton, John Smith & Ann Evamy, all of Middlesbro'. On Mar. 6, 1861, per line 1131 here, the 185 ton square stranded at Dunkirk, France, while en route from Middlesbro' to Dunkirk. Crew of 8 - none lost. Then owned by Wm. Scrafton. The circumstances of the vessel's loss are not yet to hand. Can you tell us anything additional? The vessel is recorded in Lloyd's Registers ('LR') from 1824 thru 1841/42, in 1849/50 & 1850/51, & not thereafter. During the first noted period the vessel was, per LR, owned by Bruce & Co., later at least of Aberdeen, Scotland, (stated in LR of 1834/35) later of Peterhead, Aberdeenshire, Scotland, (LR of 1835/36 & later). For some varied service - from Liverpool to Palermo, Italy, in 1826 thru 1830 from Cowes to Malta, from Leith to Riga, Latvia, ex Hull, from London to Str'ts (Straits of Gibraltar, maybe? ), from Peterhead to Gibraltar & for many years, from 1836/37, for service from London to Rio de Janeiro, Brazil. It became a brig of 111 tons in LR of 1834/35. In 1849/50 & 1850/51, the 102 ton brig was owned by 'Gravenor' for service from Dover, Kent, to Hamburg, Germany. 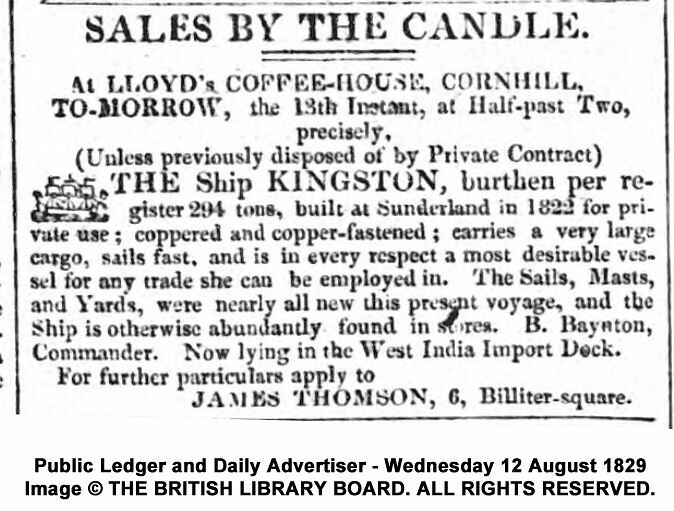 The data in LR of 1850/51 is limited - the vessel was likely sold at about that time. 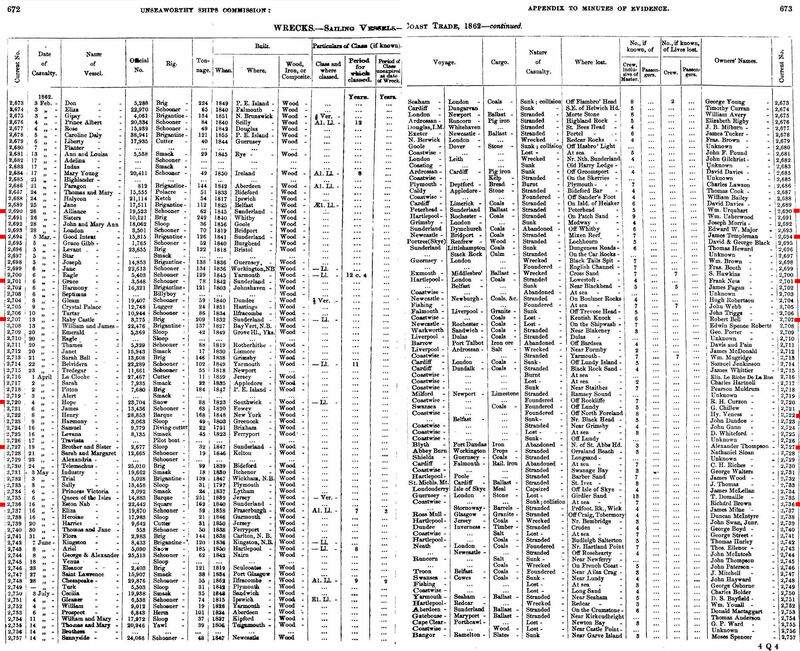 The Mercantile Navy List of 1867 lists William Bussey of Dover as the then owner of the Dover registered 95 ton vessel. 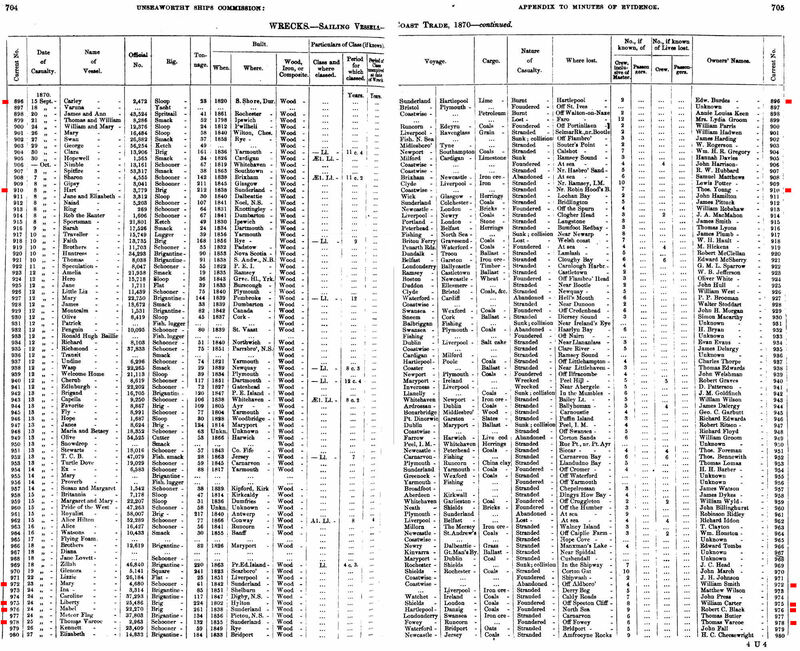 The equivalent list of 1870 lists John Tuthill, of Dover, as her then owner. Signal letters HVBR. On Feb. 3, 1872, per line 2951 here, the 95 ton schooner stranded at Filey ((Yorkshire now N. Yorkshire), while en route from Sunderland to Yarmouth, Norfolk, with a cargo of coal. None of the crew of 5 were lost. Her owner was then John Tuthill. The circumstances of the vessel's loss are not yet to hand. Can you tell us what happened? What were the official build numbers for 1823? Do please advise me if you know. T. B. Simey (her captain) possibly of Hull. From 1829/30 thru 1837/38 the vessel was owned by H. Tanner. Next Lloyd's listed in 1846/47, then owned by W. Cooke of Sunderland, a Sunderland coaster. Next Lloyd's listed 1853/54, owned by J. Reed of Sunderland, a Sunderland collier. On Mar. 10, 1860, per line 101 here, the 206 ton snow foundered in the North Sea while en route from Sunderland to Hamburg, Germany, with coal. None of the crew of 7 was lost, it would appear. The owner was recorded as being Thomas Reed. What were the official build numbers for 1824? Do please advise me if you know. The vessel is Lloyd's Register ('LR') listed from 1828 thru 1838/39 & not thereafter, though for many of those years, i.e. 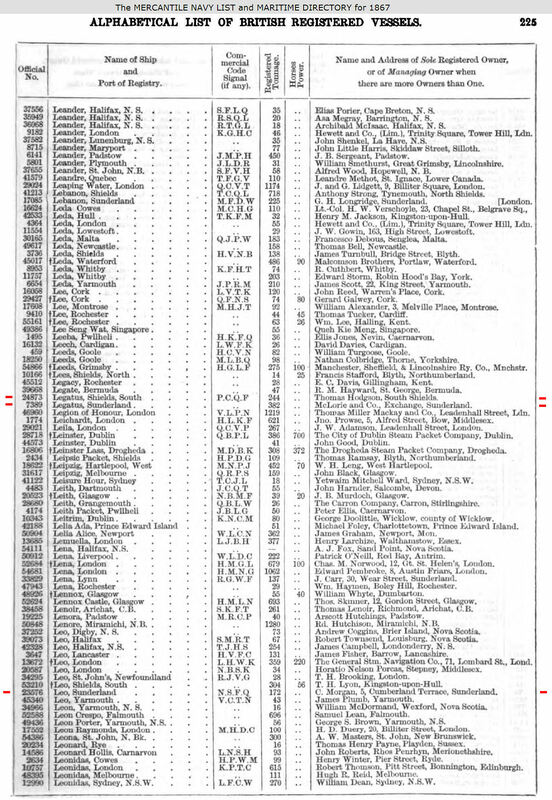 from 1834 thru 1838/39, the LR data is cryptic indeed, with no owner name or service indicated. The vessel was initially owned by T. Bateson, from 1829 T. Batson, likely of Newcastle. 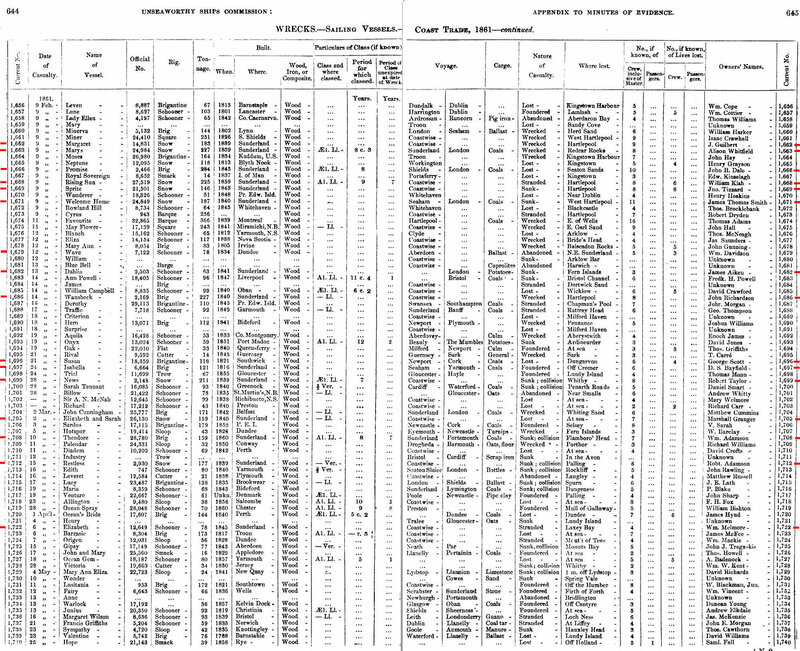 for service from Liverpool to Quebec, Canada, & from 1830 for service from Liverpool to New York. The vessel would seem to have been registered at Kirkaldy, at least from 1853. Turnbull's Register of 1856 records the vessel as being of 466 tons, registered at Kirkaldy, & owned by Kirkaldy Whale Fishing Company. 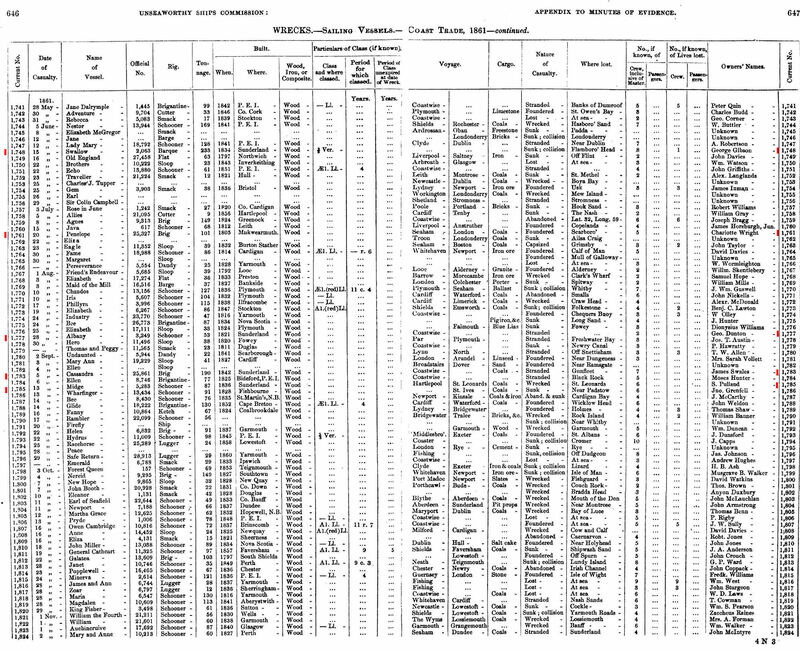 Christie's Shipping Register of 1858, lists the 406 ton vessel as still registered at Kirkaldy, & still owned by Kirkaldy Whale Fishing Co. On Jul. 5, 1862, per line 2288 here, the 406 ton square was lost in the Davis Straits (the strait on the W. side of Greenland) while whaling. A crew of 50 - none lost. Then stated to be owned by Patrick Don Swan. Can you tell us about the circumstances of her loss or otherwise add anything? A pleasant name for a ship, or so it seems to the webmaster. The vessel is Lloyd's Register ('LR') listed from 1834 thru 1852/53 & not thereafter. In 1834, per LR, the vessel was owned by Brown & Co. of certainly registered at Padstow, Cornwall, for service from Padstow to America, which service became Padstow to North America in 1839/40. T. Brown served as captain of the vessel, which, LR notes, 'wants repair' in both 1839/40 & 1840/41. In 1841/42, the vessel became owned by Avery & Co., also of Padstow, with a number of captains thru 1852/53 - J. Symons thru 1843/44, E. Key thru 1844/45, N. Reynolds or Reynolds thru 1847/48 & T. Richards thereafter thru 1852/53. For some varied service. From Exeter, Devon, to North America thru 1842/43, from Padstow to Quebec in 1843/44, from Padstow to N. America thru 1845/46, from Limerick, Ireland to New Orleans, U.S.A. in 1846/47 & 1847/48, from Dartmouth, Devon, to Quebec thru 1849/50 & from Topsham, Devon to Quebec thru 1851/52. 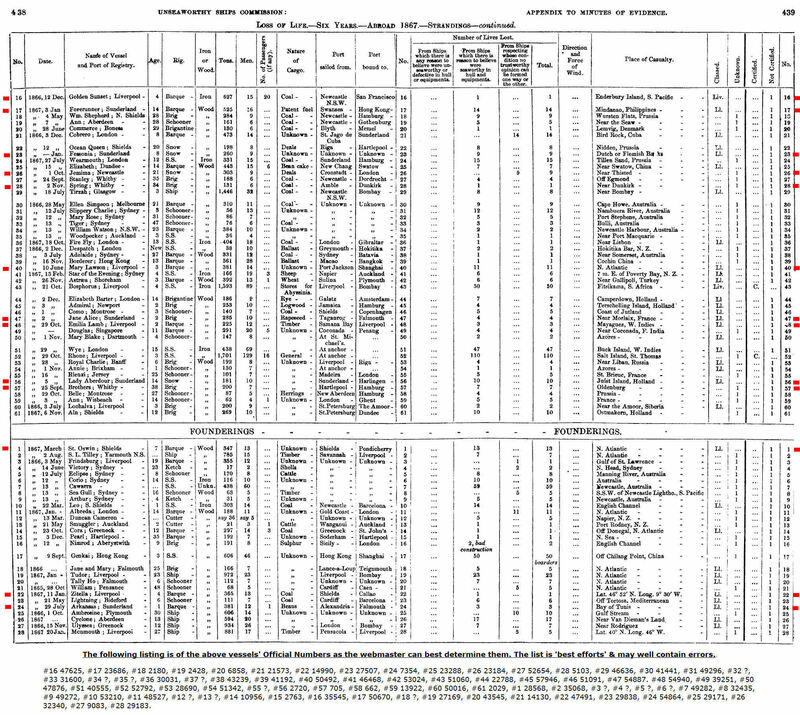 The LR data in 1852/53 is limited, which suggests that the vessel may well have then been sold. As indicated above, the vessel was not LR listed after 1852/53. It would seem however, per the Mercantile Navy Lists ('MNL'), that the vessel continued to be Padstow registered thru to 1859. From 1860 it was registered at Shields & MNL from 1865 thru 1868 indicates that the vessel was owned by Thomas Pickering of North Shields. 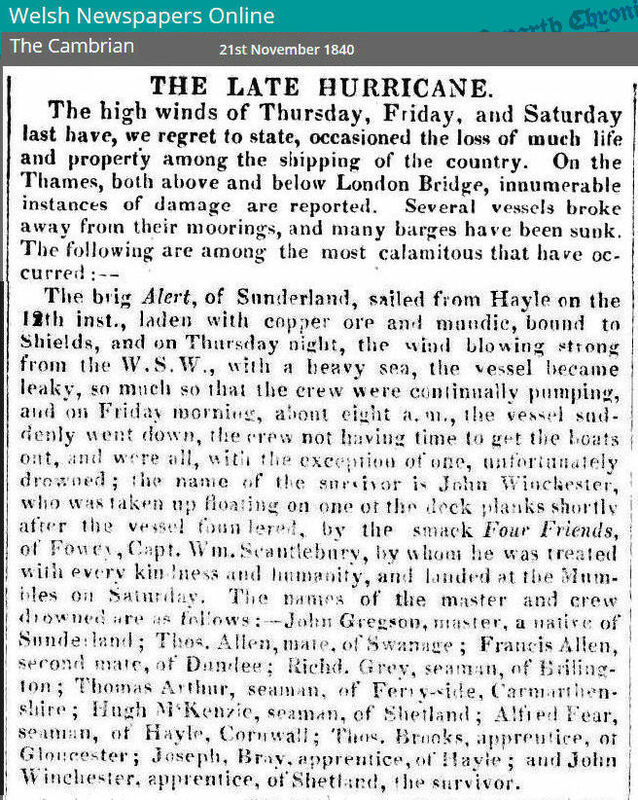 Line 22 on this page tells us that on an unstated date in Nov. 1868, the 196 ton brigantine, (incorrectly listed as Spring Flowers - with an extra 's' on the end), went missing while en route from North Shields to London with a cargo of coal. The vessel had a crew of 6, all lost of course. The listing does not specify, even roughly, where the vessel was when she went missing, stating simply that it was lost 'On voyage'. 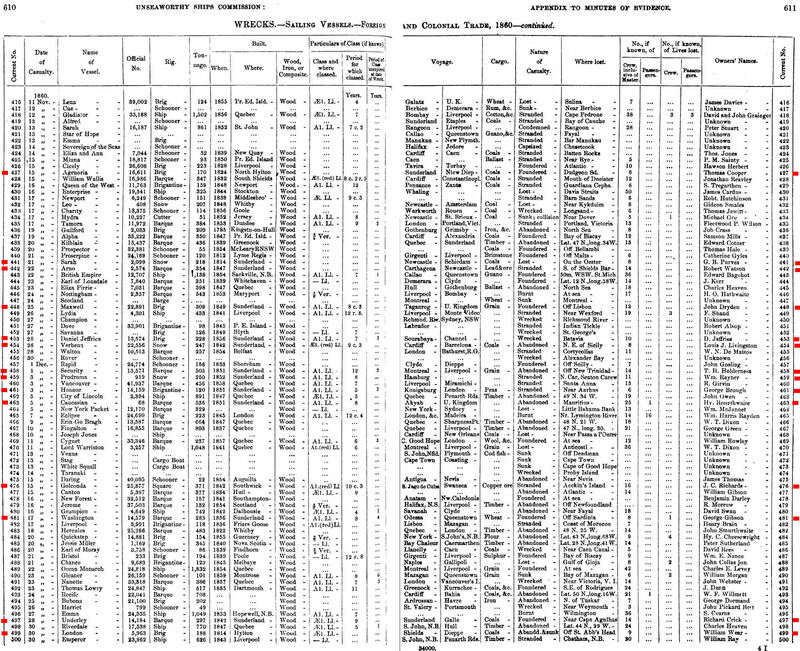 I would be remiss if I did not refer to the vessel's many sailings to eastern Canada with Cornish emigrants ex Padstow. 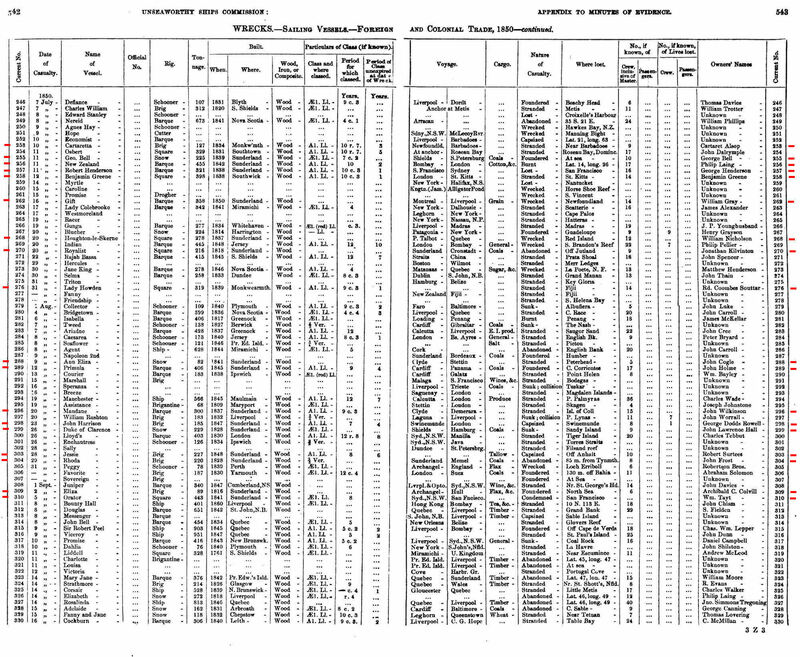 I have spotted, via a Google search, references to such voyages in the years from 1830 thru to 1842. I read that from 1831 to 1860, 6,200 persons emigrated from Cornwall to Quebec & that in 1841 Padstow (when 600 so emigrated) was the 3rd most important U.K. emigrant port. Typically, it would seem, the vessel would sail to Quebec City with emigrants & return later to the U.K. with a cargo of lumber. Generally the vessel carried in the range of 25 to 57 passengers, but there would seem to have been two voyages in 1832 under captain T. Brown & one of them is said to have carried 128 passengers. One Google 'snippet' seems to refer to a Spring Flower voyage with no less than 180 passengers aboard. Notable perhaps is an Apl. 1842 voyage under captain Key which left Padstow with 30 passengers, encountered a major storm in mid Atlantic which set her on her beam ends & caused the loss of her masts & rigging. The vessel was able to successfully limp back to Padstow. Some of the many links that I visited - 1, 2, 3, 4. I thank them all. T. Walker & Co. (Walker was the captain). Not in Lloyd's Register ('LR') 1834/35 thru 1838/39. 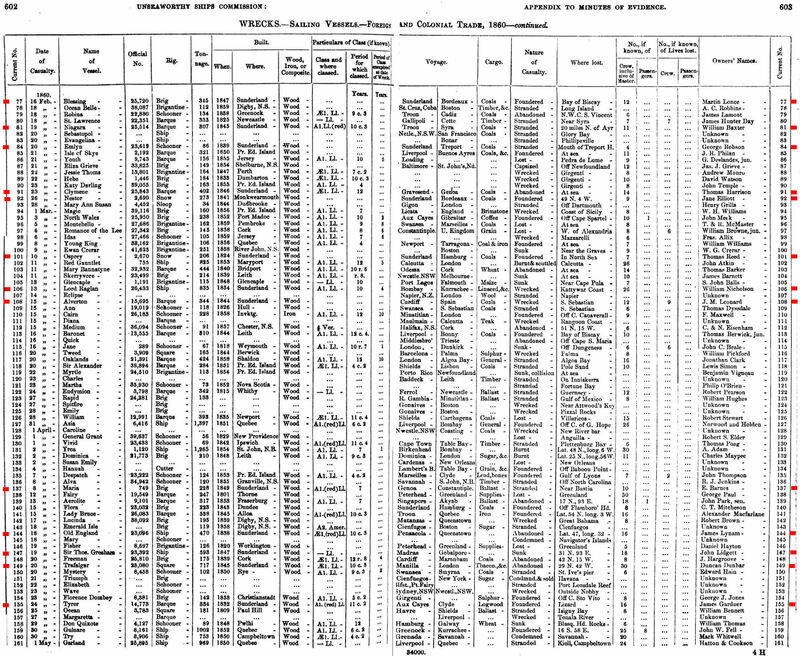 Then from 1839/40 thru 1843/44 T. Walker of Sunderland. Cannot see later recorded in LR. However Turnbull's Register of 1856 advises that the vessel, then a brig, was owned by R. (Robert) Morrison, jun., of North Shields & the vessel, then 194 tons, is Mercantile Navy List recorded in 1860. On Oct. 17, 1860, per line 387 here, the vessel, a brig, foundered off the Humber while carrying coals from Shields to Nieu Diep (Nieuwe Diep, N. end of North Holland Canal, effectively Amsterdam). 6 of the 7 man crew were lost. Then owned by Robert Morrison. What were the official build numbers for 1825? Do please advise me if you know. The webmaster has not researched this vessel, which however, was first listed in Lloyd's Register ('LR') of 1827, owned by P. Percand for service ex Plymouth. I include it having spotted a reference to the 189 ton brig being 'LOST' in LR of 1848/49. It was then stated to be owned by Perchand of Jersey for service from Cork, Ireland, to Gasp�e. (Gasp� & Gasp� Peninsula, Quebec, Canada). A vessel that had a very long life indeed. Ceres is Lloyd's Register ('LR') listed from 1828 thru 1838/39, then a 14 year LR silence, then from 1853/54 thru 1867/68. The vessel was first owned (1828 thru 1833) by W. Bagge & Co. for service as a Lynn, Norfolk, coaster. After 1833 the LR data is cryptic indeed - Bagge likely continued to own the vessel throughout that period since 'Plowright', his captain from 1828, continued as her captain thru 1838/39. In 1853/54, per LR, the vessel, now of 155 tons, was owned by Minns of Lynn with J. Minns her captain (thru 1855/56). J. Minns was her owner until part way thru 1865/66. The vessel mainly served as a Lynn coaster, however, from 1861/62 thru 1865/66 the vessel served as a Sunderland coaster. In 1865/66, her service reverted to coasting duties ex Lynn, now owned by J. Owen of Lynn thru until part way thru 1867/68 with J. Owen her captain. In 1867/68, now of 149 tons, the vessel became owned by J. Simpson, and is noted in LR to have been 'Wrecked'. 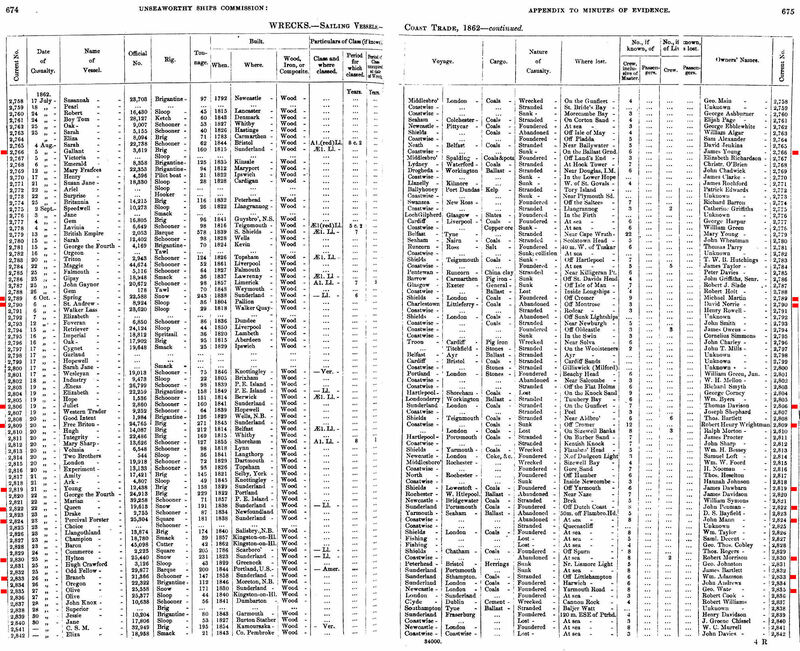 The Mercantile Navy List of 1867 lists her then owner as being James Simpson of King's Lynn, Norfolk, as does the equivalent register of 1868. Can you tell us what happened to the vessel in or about 1868 or otherwise add anything? The vessel is Lloyd's Register ('LR') listed from 1827 thru 1841/42, and not thereafter. From 1827 thru 1838/39, the vessel was, per LR, owned by the Hall family, of Sunderland (LR from 1834) - initially Hall & Co., later Halls - with Meldrum the vessel's captain thru that entire period. Initially for service, thru 1831, from Leith to St. David's, both Scotland, in 1832 & 1833 for service from Leith to Archangel, Russia, & from 1834 for service from Sunderland to London. From 1839/40 to 1841/42, no owner name is LR recorded, however the captain was stated to be R. Ayn. LR of 1841/42 notes that the vessel had been 'Abandoned'. Can you tell us what happened to the vessel in or about 1841 or otherwise add anything? What were the official build numbers for 1826? Do please advise me if you know. The vessel would seem to have been Lloyd's Register ('LR') recorded from 1828 thru 1841/42, a gap of 6 years, then from 1848/49 thru 1854/55. During the period thru 1841/42, the vessel was, per LR, owned by Collingwood of Sunderland, with J. Curry, Wood, 'Wardrppr', and Almond serving as the vessel's captains. For service i) initially from London to Cadiz, Spain, ii) from 1830 thru 1833 for service from Cowes, Isle of Wight, to Bilbao, Spain, & iii) from Sunderland to France thereafter. 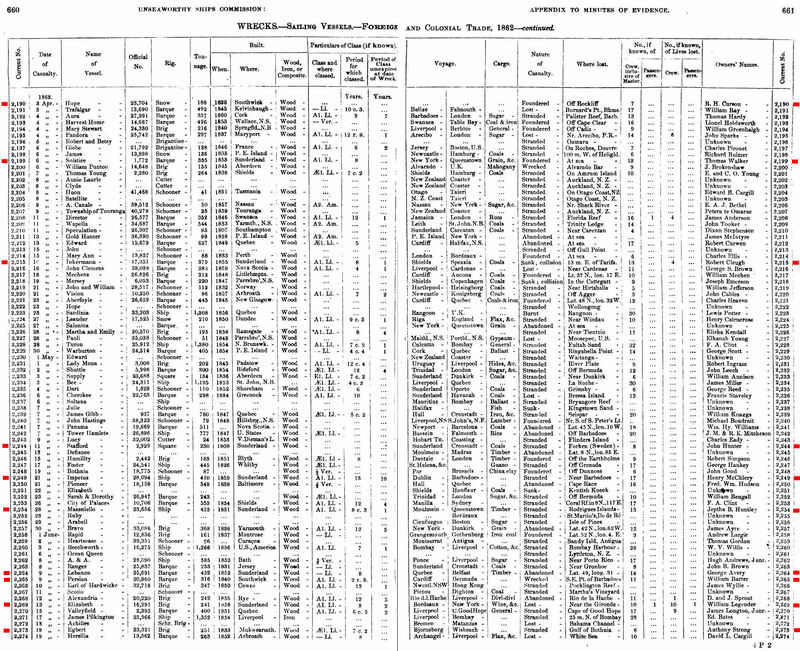 I can next track the vessel in the North of England Maritime Directory of 1848 where the 137 ton snow is listed as registered at Newcastle & owned by George Younghusband of South Shields. From 1848/49 thru 1854/55, per LR, the vessel was owned by 'Coltm'n', clearly Coltman, of South Shields with J. Tullock, J. Coltman & A. Morrison serving as her captains. For service ex Shields to such ports as London, Boulogne & Rouen (both France) & Galatz (i.e. Galați, on the Danube, Eastern Romania, Black Sea). 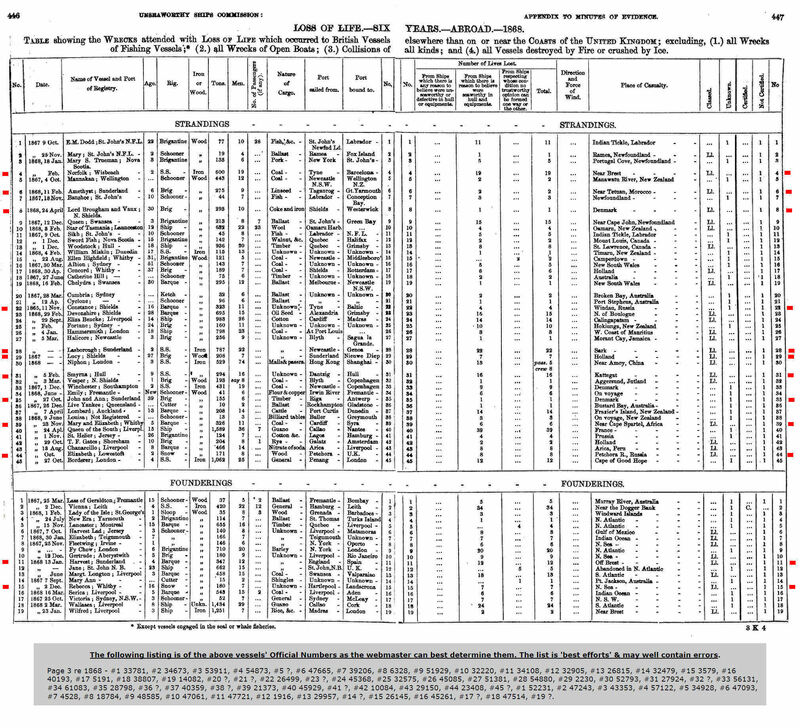 The LR data re years 1853/54 & 1854/55 is minimal, which suggests that the vessel may well then have been sold. 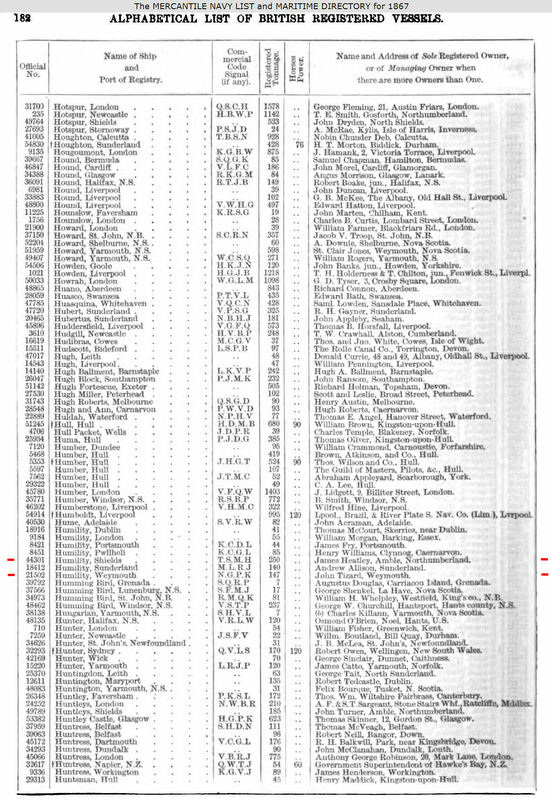 The North of England Directory of 1854 lists Cuthbert Forster of Newcastle as the vessel's owner with W. Forster the vessel's captain. Turnbull's Register of 1856 confirms such data & advises her Official Number ('ON') to be 3789. Now the data in such register has proved over the years to be amazingly reliable, but I suspect that the recording of ON 3789 may have been in error. The vessel seems not to be listed in Christie's Shipping Register of 1858 which covers much of the NE. There are no later editions of LR to assist us in our search for data. We do know that on Oct. 27, 1868 a 155 ton brig of the name, stated to be 39 years old & registered at Sunderland, was wrecked at Denmark while en route from Riga, Latvia, to Antwerp, Belgium, with a cargo of timber. Such vessel apparently had a crew of 6, one of whom lost his life in the stranding. Which was at place called Ferring (on the Danish Jutland west coast). As per line 35 on this page. 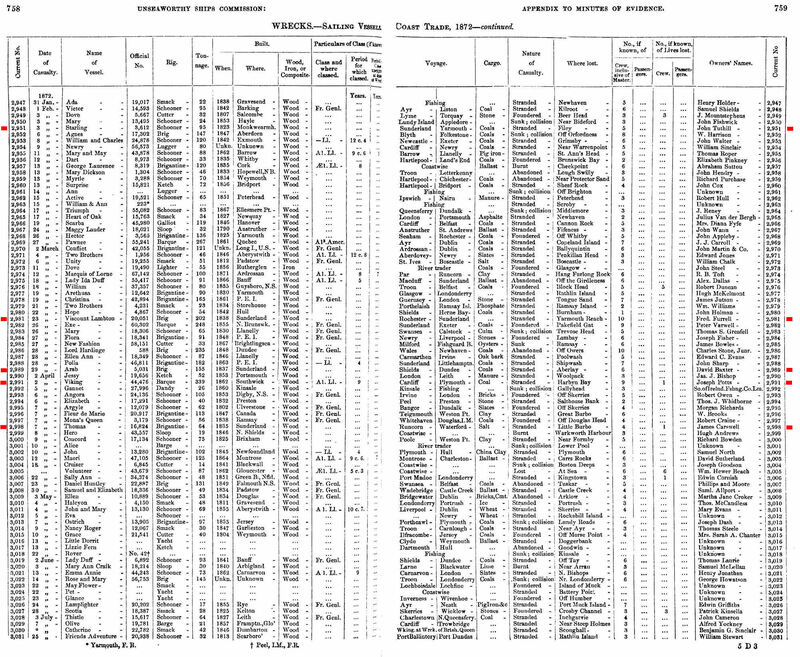 The Mercantile Navy Lists of 1865 thru 1868 list John Colling of Sunderland as the then owner of such vessel which had an ON of 28798. Which vessel would seem to have been registered at Sunderland from 1860. The vessel would seem to have been first Lloyd's Register ('LR') recorded in 1830/31, a brig 3 years old, owned by J. Storey for service which included to Quebec, Canada. In 1836/37, the vessel became owned by Ridley & Co. of Sunderland. From 1839/40 the owner became Tredwen of Padstow for service from Padstow to Quebec. W. Henry of Quebec owned the vessel briefly. In 1847/48 Jessimin of Dundee owned the vessel for service ex Liverpool. The vessel seems not to be LR recorded from 1848/49. What happened to her, I wonder? Need help! 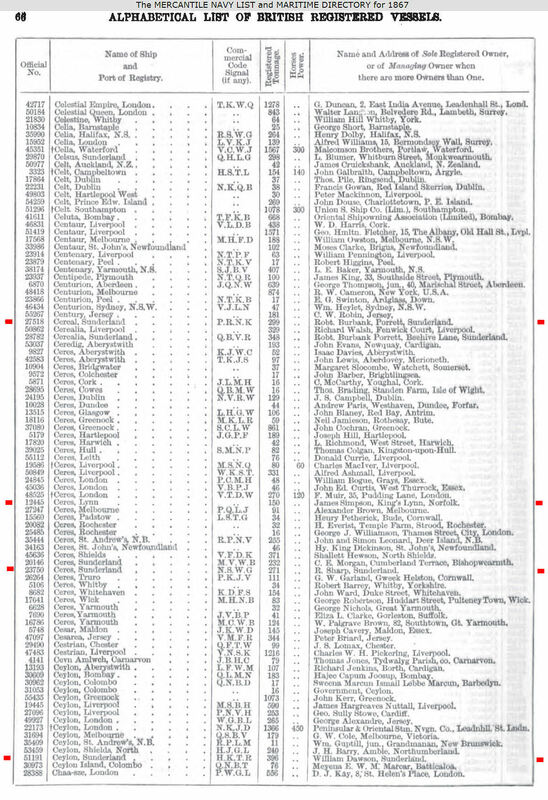 While Lloyd's Register still needs to be researched re this vessel, the 1839/40 edition lists the vessel as being owned by Dowell & Co. of Sunderland for service from Sunderland to Southampton. Was registered at Arundel, West Sussex. On May. 28, 1860, per line 696 here, the 134 ton square was abandoned at Gunfleet (7 km. SE of Clacton-on-Sea, Essex), while en route from Sunderland to Rochester, Kent, with a cargo of coal. Crew of 6, none lost. Then owned by John Heward. The vessel is Lloyd's Register ('LR') listed from 1834/35 thru 1841/42 & not thereafter. Owned by T. Crozier of Sunderland for service from Sunderland to London. Turnbull's Register of 1856 advises she was still owned by the Crozier family - by J. Crozier of Sunderland. 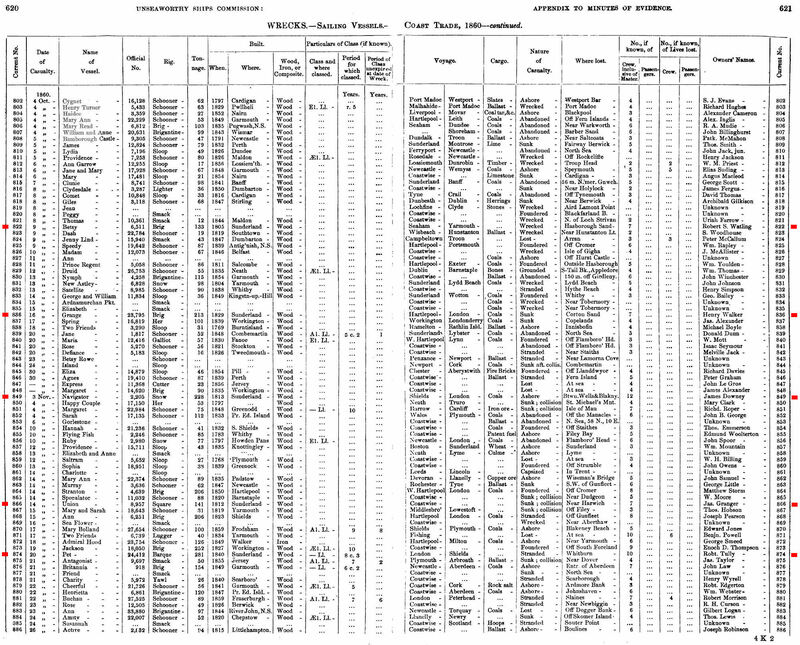 Christie's Shipping Register of 1858 lists John, William, and William Eggleston Jun. & George H. Longridge, all of Sunderland, as her then owners. On Dec. 14, 1860, per line 904 here, the 204 ton snow foundered off St. Abb's Head, Berwickshire, while en route from Sunderland to London. Can that routing be correct? St. Abb's Head is far to the north of Sunderland. Crew of 10 - none lost. The vessel is stated to have been owned by William Eggleston. What were the official build numbers for 1827? Do please advise me if you know. 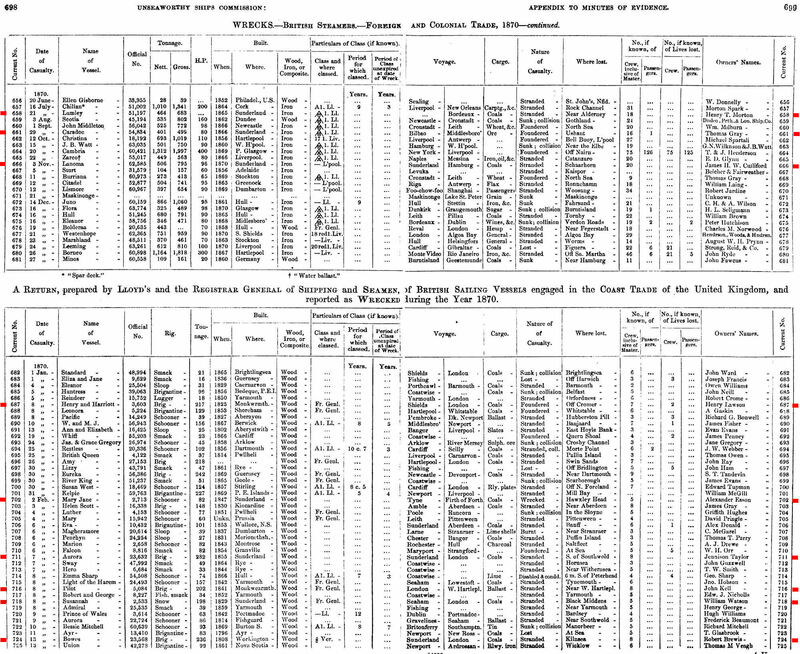 Hunter & Co. Christies Maritime Register of 1858 states that Geo. T. Fox of Durham & R. Dawson of South Shields were the vessel's then owners. The vessel is Lloyd's Register ('LR') listed from 1829 thru 1852/53, owned thru 1837/38 by 'Donaldsn', presumably Donaldson, likely of London (per LR of 1837/38). For service from London to the Cape of Good Hope, South Africa, thru 1836/37 & from 1836/37 for service from London to Jamaica. In 1838/39, per LR, the vessel became owned by Ewing & Co. of Glasgow, mainly for service ex the Clyde to i) Jamaica in the period of 1838 thru 1841, ii) St. Kitts in 1841/42, iii) the West Indies in the periods of 1842 thru 1846, & 1847 thru 1850, iv) to Demerera, British Guiana, in 1846/47, & in 1850/51 for service from London to the West Indies. The vessel became a brig in 1848/49. In 1851/52, per LR, Grange of Ayr, Scotland, became the vessel's owner with A. Grange her captain. 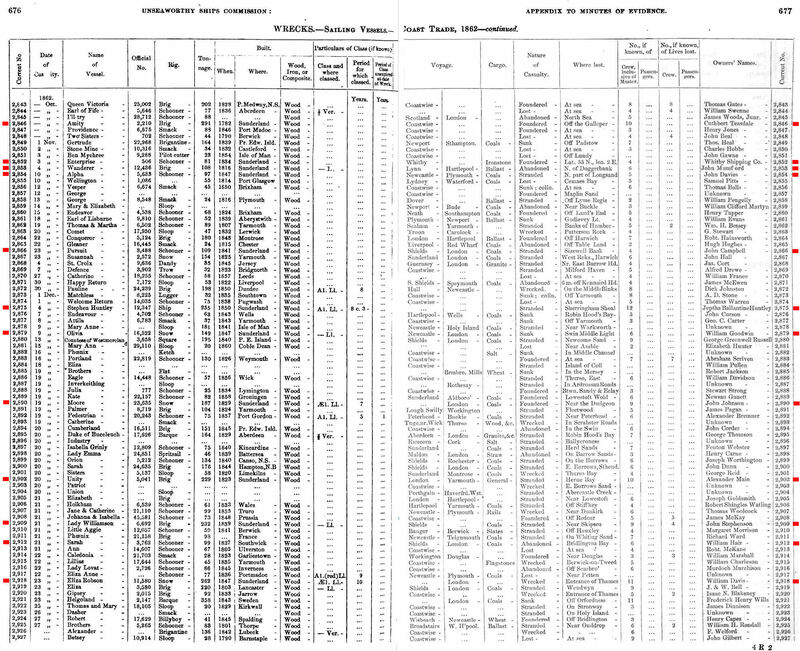 For service in 1851/52 from the Clyde to Valparaiso, Chile. The LR data re 1852/53 is limited which suggests that the vessel may have been sold or may have been lost. I cannot see the vessel listed in LR later than 1852/53 but do not know what happened to the vessel. Can you add anything? The vessel is Lloyd's Register ('LR') listed from 1829/30 thru 1846/47 except for 1839/40. It was initially a barque, owned by Holmes & Co., for service from London to the Cape of Good Hope (South Africa near the southern tip of Africa). In 1832, the vessel, now a brig of 212 tons, is noted as sailing to St. Helena (a tiny & remote island in the S. Atlantic, about 1,250 miles off the coast of southern Angola, surely not a destination rather a stop on the sailing route) ex London. In 1833/34, Horn & Co. are LR listed as the vessel's owner for service from London to the Cape of Good Hope. 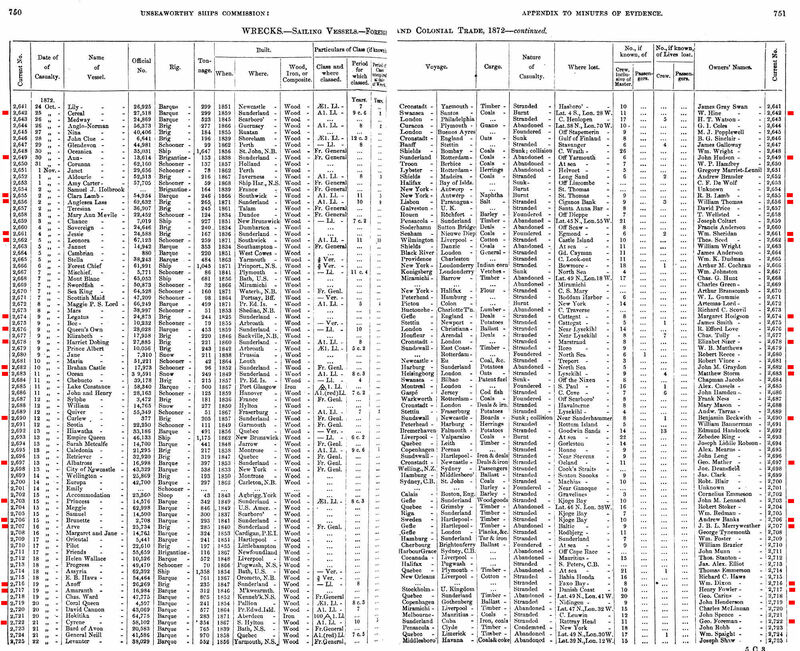 The LR entries from 1833 thru 1838/39 are cryptic indeed, with no owner name, vessel rig or routing indicated, etc. From 1840/41 thru 1846/47, F. Barnes of London is listed as the vessel's owner for service ex London to Trinidad (1842/43) to the West Indies (1843/44 thru 1845/46) & thereafter for service from Hull to London. 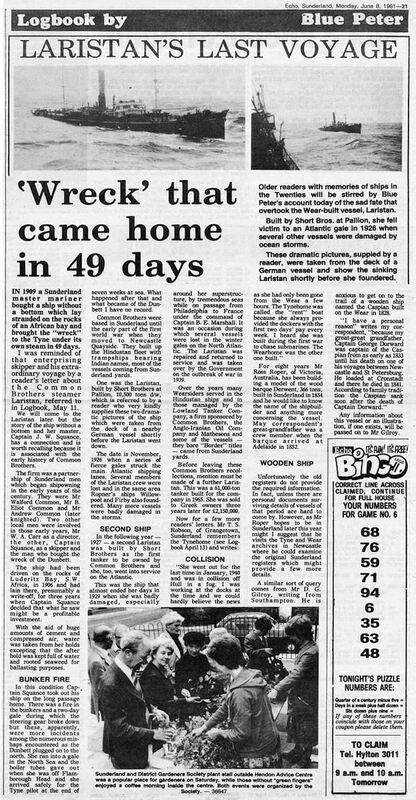 LR of 1846/47 notes that the vessel had been 'wrecked'. The circumstances of the vessel's loss are not yet to hand. Anything you can add? So far as the webmaster can see, this vessel was never listed in Lloyd's Register. It is listed in the North of England Maritime Directory of 1848, then owned by Richardson, Frost & Co. of Sunderland. On Aug. 29, 1850, per line 304 here, the 220 ton brig was abandoned in the North Sea when 85 miles from Tynemouth. While en route from Sunderland to Memel (then E. Prussia, now Klaipėda, Lithuania), with a cargo of coal. Crew of 8 - none lost. The stated to be owned by John Frost. Is there anything you can add to this modest listing? For own account. Lloyd's Register of 1882/83 advises that the vessel, then a brig of 172 tons owned by R. Lynn of Hartlepool, had been lost. What were the official build numbers for 1828? Do please advise me if you know. The webmaster has not researched this vessel. He merely notes that Lloyd's Register of 1869/70 records the vessel as 'Wrecked'. Then owned by J. Crossley of Sunderland for service as a Sunderland coaster. A few earlier LR references, however. In 1856/57, then of 71 tons, the vessel was owned by S. Paxton of Berwick for service as a Berwick coaster. In 1862/63, per LR, the vessel then of 97 tons was owned by Morton & Co. of Ipswich for service as an Ipswich coaster. Hopefully the vessel will soon be better identified. So far as I can see, the vessel is Lloyd's Register listed from 1831/32 thru 1841/42 only & not thereafter. Owned for that entire period by Greenwell of Sunderland for service from Sunderland to Quebec, Canada. Was later registered at Scarborough. 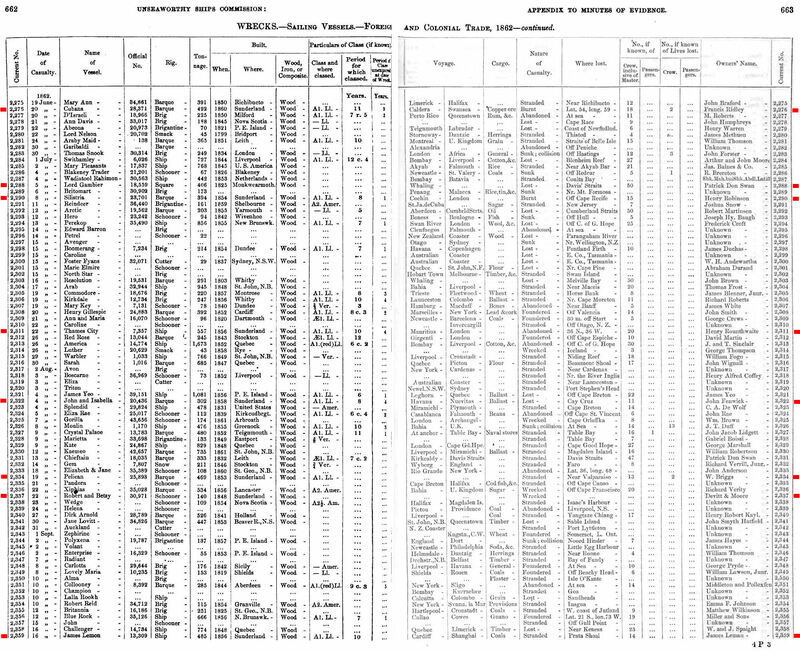 Christie's Shipping Register of 1858 records her owners as being T. B. Walker, and 3 members of the Fowler family i.e. W.B., Wiiliam, & Isabella Fowler. On Oct. 16, 1860, per line 836 here, the 213 ton brig sank at Corton Sand (N. of Lowestoft, Suffolk) while en route from Hartlepool to London with a cargo of coal. Crew of 7 - none lost. The vessel was stated to be then owned by Henry Walker. Have not researched this vessel - some data snippets only. The vessel's initial owner is unknown to the webmaster. It was owned, per Lloyd's Register ('LR') by A. Dixon in 1834 & also in 1855/56. The vessel, in 1834 & 1840/41 at least, per LR, provided service from Newcastle to London. The vessel seems to be listed in Turnbull's Register of 1856 not as Navus but rather as Nevis, registered at Shields. It is listed in Christie's Shipping Register of 1858 as Navus, a 220 ton brig, owned by Alex Dixon of South Shields. 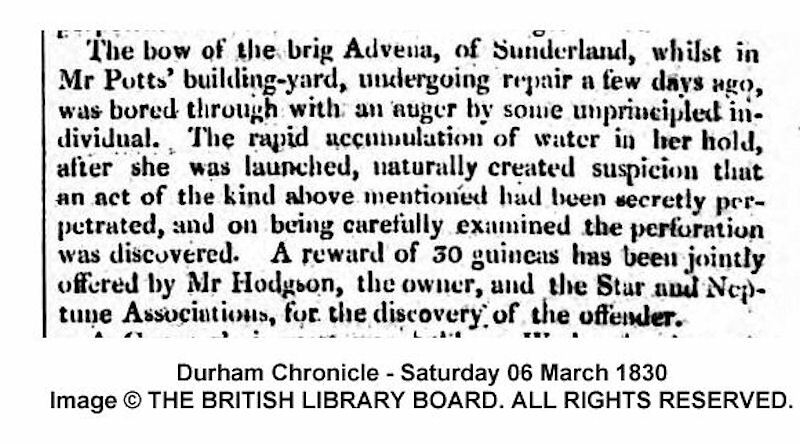 I am advised that the Newcastle Courant of Jan. 29, 1858 reports that Navus (which according to Turnbull's Annual Register was built in the Wear in 1829, & owned by A. Dixon of South Shields with a captain named Dixon), was lost on the Ridge Sand. No date of the loss was provided. There is a Ridge Sand, located close to Princes Channel, in the Thames Estuary on the Kentish shore. Is it the correct Ridge Sand? Need help. The vessel is Lloyd's Register ('LR') listed from 1834 thru 1838/39, but is listed most cryptically with just the captain's name (S. Howe or S. J. Howe) & the tonnage (217). It is also listed from 1839/40 thru 1843/44 owned by Howe & Co. of Sunderland for service from Sunderland to London. It is again listed from 1848/49 thru 1850/51, but not thereafter, still owned by Howe & Co. for service from Sunderland to London. 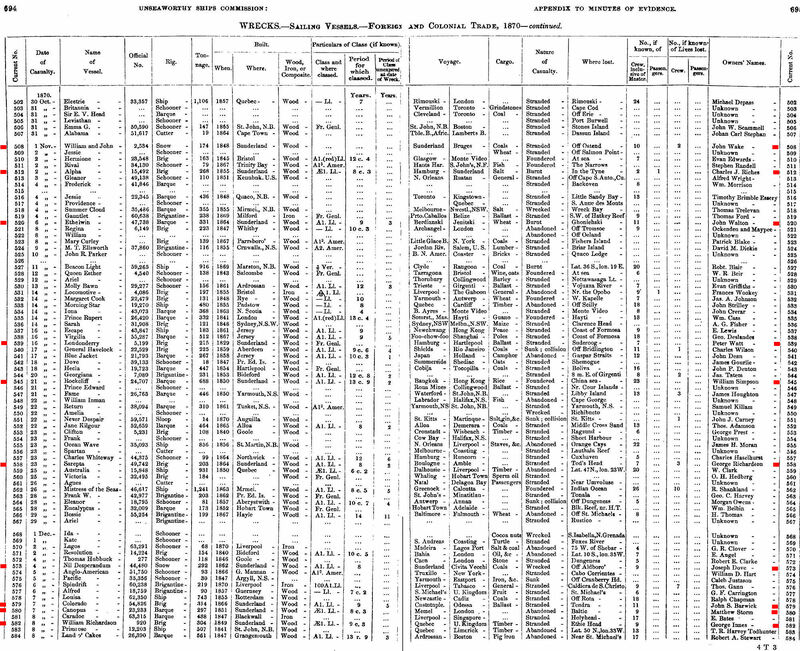 Turnbull's Register of 1856 lists S. J. Howe of Sunderland as her then owner, which Christie's Shipping Register of 1858 clarifies as meaning Sanderson J. Howe. 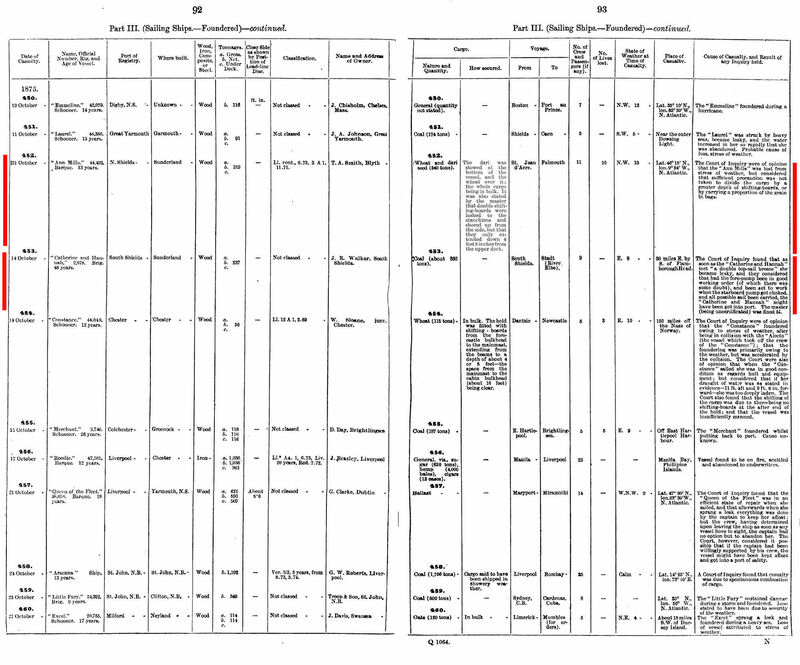 The Mercantile Navy List of 1870 records the vessel, now of 198 tons, as then owned by Wm. Watson of Seaham. Signal letters HPMT. On Feb. 8, 1870, per line 718 here, the 198 ton snow was stranded at Black Middens (rocks at the mouth of the Tyne, covered at high water) while en route from Seaham to London with a cargo of coal. They would appear to have been off course. Crew of 5 - none lost. Vessel then owned by William Watson. What were the official build numbers for 1829? Do please advise me if you know.